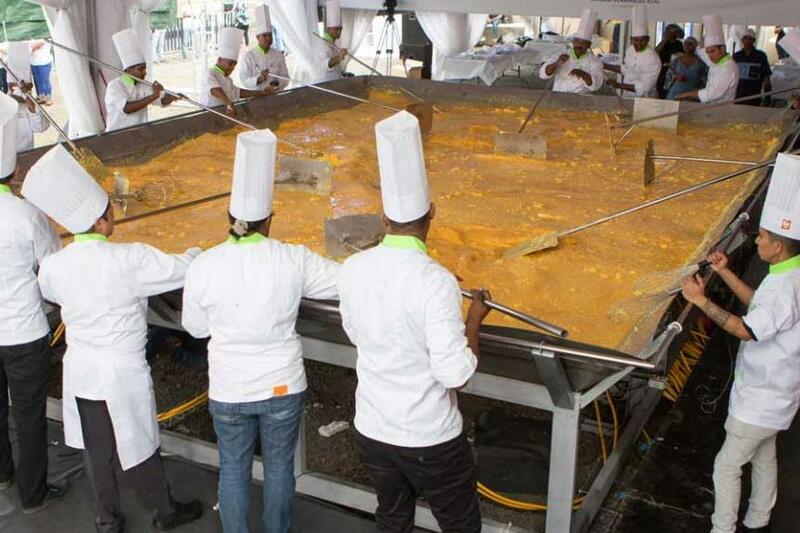 A team of more than 20 chefs came together in Mauritius to cook up a 5,436-pound, 9.58-ounce serving of scrambled eggs certified as the world's largest. Guinness World Records said the massive helping of scrambled eggs cooked up by Inicia Ltee, the East African island nation's largest egg production and distribution company, was the largest scrambled eggs ever cooked. The record-breaking dish, which was created to celebrate Inicia Ltee's 40th anniversary, included 35,000 eggs, nearly 950 pounds of butter, 65 gallons of milk, 22 pounds of salt and nearly 5 pounds of pepper. Mooroogun Coopen, president of the Mauritian Chefs Association, led a team of more than 20 chefs in creating the scrambled eggs. More than 8,000 portions of scrambled eggs from the event were donated to international aid organization Caritas.